Sudbury, Mass. - The Lincoln-Sudbury Warriors gave the two-time defending Division 1 state champion Cambridge Falcons all they could handle on Friday night, including an aggressive zone defense and a double-digit comeback in the second half. 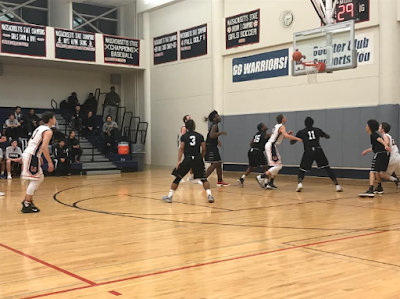 The Warriors had the game’s leading scorer in senior Brett Flanagan (19 points) and collected 15 steals, but ultimately, it was not enough to put Lincoln-Sudbury over the top, and Cambridge held on for a 60-54 win over the Warriors in Sudbury on Friday night in a Dual County League battle. The Warriors (6-4, 5-3 DCL) used a zone defense and full-court press to try and prevent Cambridge (11-1, 7-0 DCL) from getting the ball inside to stars Khai Smith and Jonathan Cenescar. However, the Falcons had the clear advantage down low and dominated the boards, outrebounding Lincoln-Sudbury 38-26. They were able to find Smith and Cenescar in the post down the stretch when it mattered most. Midway through the third quarter, it looked like Cambridge would be cruising to victory after going on an 11-2 run to open up a 45-32 lead. Smith, who had a double-double with 15 points and 14 rebounds, scored 6 points over that span. Smith said that he was focused more on rebounding than scoring. “I just really focused on rebounding the ball and tried to score near the basket,” Smith said after the game. The Warriors responded with a 9-2 run of their own to close the quarter, cutting Cambridge’s lead to 47-41 entering the fourth frame. 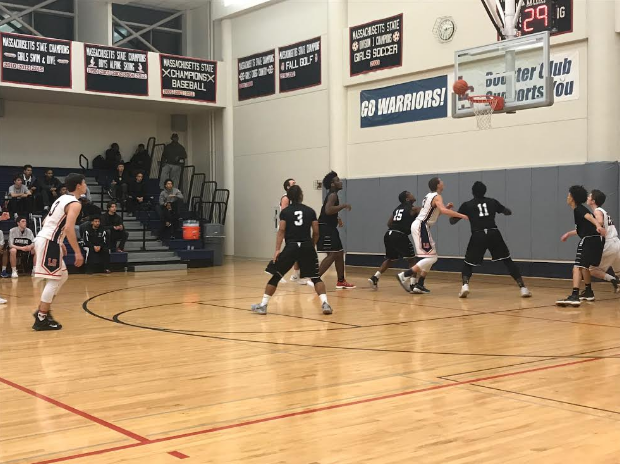 L-S scored the first five points of the fourth quarter on a layup by Michael MacKinnon (9 points) after a Cambridge turnover and a three-pointer from Kahmari Williams after an offensive rebound from Milind Lele. Smith extended Cambridge’s lead to 49-46 on a pair of free throws with 5:39 remaining, but a layup by Flanagan after a Cambridge turnover made the score 49-48. Cambridge head coach Lance Dottin attributed “poor passing and bad decision-making” against Lincoln-Sudbury’s pesky zone defense to his team’s turnovers. After a corner three-pointer from junior Hakan West (15 points, 4 rebounds, 3 assists, 3 steals) gave the Falcons a 52-48 advantage with 4:20 remaining, Lincoln-Sudbury tied it at 52 on a reverse layup from senior Travis Surin (9 points) and a basket from Keith Hylton (4 points, 7 boards, 3 steals). The Falcons promptly got the ball inside to Cenescar (12 points, 10 rebounds), who laid it in the put the Falcons ahead 54-52 with 3:02 remaining. A driving layup by Surin tied the contest at 54 with 2:10 remaining. The Warriors got the ball back with 2:01 left on the clock after a Cambridge turnover, but could not take the lead. The Falcons had the chance to take the lead 10 seconds later but missed a pair of free throws, keeping the game tied at 54 with 1:49 remaining. L-S turned the ball over with 12.7 ticks remaining, and West made a pair of free throws to seal the win for Cambridge. Coach Dottin was happy with the way his team responded in the final minutes after losing a 13-point lead. “I like the fact that down at the end, we were able to execute defensively and then be able to get the ball and make free throws,” Coach Dottin said after the game. Coach Dottin said that Friday’s game was a chance to improve. The Falcons responded well after their 53-game win streak was snapped last Friday night by blowing out Waltham on Tuesday. Against L-S, Cambridge showed that they can close out games and make plays down the stretch against a tough defense. The Falcons will be back in action on Sunday when they travel to Acton-Boxborough. Lincoln-Sudbury demonstrated that they have a dominant defense, but did not have the rim protectors to match up with Smith and Cenescar. The Warriors will to try to return to winning ways on Tuesday when they travel to Burncoat in a non-league matchup.